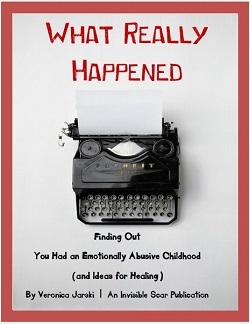 When you look up the definition of emotional child abuse, several examples are listed: giving the silent treatment, ranking children unnecessarily, being condescending, bunny boiling, gaslighting children, scapegoating, sabotaging, favoritism, triangulation, pathological (or compulsive) lying, smearing, corrupting, ignoring, corrupting, terrorizing, isolation, and inappropriate control. To better understand the different facets of emotional child abuse, we’ll be exploring one trait per post. In this post, we’ll look more closely at the emotionally abusive form of child abuse called “the silent treatment” (also “withholding”). It is also used in adult relationships, but for the purpose and focus of The Invisible Scar, we’ll study the silent treatment as it relates to children. A parent stops talking to a child because the child did not anticipate the parent’s needs. Perhaps the parent expected the child to do a chore or a task without being told to do so and, when the child fails to meet that expectation, the parent will not talk to the child for a long time. A parent who did not like what a child said will withhold as punishment. For example, a child may have not liked dinner and called it “gross” or “disgusting.” The parent will then no longer talk to the child for a long time. A parent will ignore a child who did not show the proper amount of support, attention, or enthusiasm for what the parent deemed importance. For example, the parent may have mentioned something that happened at work, and the child did not react with the attention or enthusiasm that the parent demand. The child will then be ignored. Note that all the above examples cite regular behaviors in the children…. A child does forget to do chores, a child will call something gross and refuse meals at times, a child will not care very much about what happens in the workday of the parent. The child is behaving very much like a child; unfortunately, the parent is not behaving to his/her appropriate maturity level. The parent, in all those examples, is demanding for the child to meet the emotional needs of the parent. However, a good parent offers unconditional love and support; an emotionally abusive parent demands unconditional love and support from his/her child. The silent treatment then is the parent’s punishment of the child for not giving that unconditional support and love. The result is intense pain for the child. Is There a Difference Between a Time-Out and the Silent Treatment? Sometimes, children are sent to their rooms (in a “time-out”) to think about what has happened (if the child behaved in a way that hurts, either emotionally or physically, another member of the family). That is not a form of child abuse if it’s a cooling-off phase. The difference between a time-out and a silent treatment is explained well on a chart on this Out of the Fog page. My dad has frequently used the silent treatment on my mom and me. He would never tell us why he was angry – he would go beyond not talking to us and completely pretend like we didn’t exist. This would go on for anywhere from two days to a week. However, what he has done lately has exceeded that. I have been doing some research, and I am convinced that my dad has a narcissistic personality disorder. At the urging of my therapist, I attempted to talk to him and start a conversation about the emotional and sometimes physical abuse he bestowed on me all throughout my childhood. This had the opposite intended effect, and he has been giving me the silent treatment for the past year and a half. He has even gone as far as passing the treatment on to my fiance as well. It has ripped my family apart (mostly because everyone – 2 half siblings and mom – are blaming me for causing this to happen) and every day I struggle with the hurt and anger. I have considered going back to therapy, but the reason I stopped going is that my head would be so foggy that there would be no conversation, and I had such a hard time concentrating on what the therapist was saying that I didn’t hear or retain anything. Are there any online forums where I can connect with other acons? Maybe that way I can talk on my own time and find people who know what I’m struggling with. I distinctly recall my mother giving the silent treatment when she was upset with my father and/or my sister; I needn’t have done anything myself. I’d walk by her in the living room and say something and she’d sit in her chair acting like I wasn’t there. Yes, it really hurt and made me feel small. She played one family member against the other…if she was upset with one of us, the rest had to be too. I didn’t think of it like this then, but the message was not only I didn’t exist but that somehow it was my (and others) responsibility to “make amends”, make her feel better. The focus was on her feelings alone, and she was very emotionally immature. 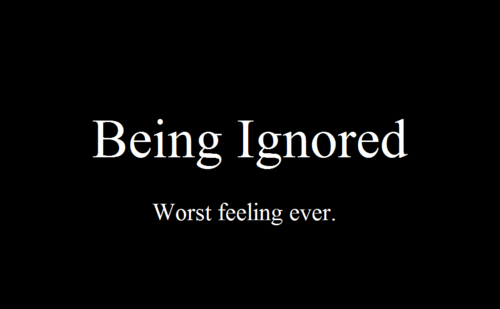 The silent treatment is cruel because you’re just shut out and feel so powerless. At the time me and my sister rolled our eyes at Mom’s behaviour, but as time goes on it’s more and more clear how damaging it was. I’m so very sorry to hear that you experienced the silent treatment. As you said, the worst part of enduring it is that feeling of being invisible, of not mattering or existing to the person who should love you most in the world. It’s a terrible feeling, and the wounds of it last a very long time. Healing from it takes a very long time. It does mark us… but in time, adult survivors come to realize that they do matter, their existences are important. You’re not invisible to me, Emily! And I wish you the best on your path to healing. It does make us feel invisible like we don’t matter. In order to cope, we internalize these feelings and then project them out, in most cases, without realizing it, to various degrees. This blog is so helpful to us children of Narcissist parents, especially the Scapegoat child. I can totally relate to you on this, my mother would subject me to silent treatments when she would get into a disagreement with my father and I would take his side, often these would last anywhere from 2 days to 2 months. Now I am dealing with depression and a recent death in the family, and not at all surprised that she refuses to offer me any emotional support and instead holds it against me that I am closer to my in-law relatives than my own family, WTF??? I am trying my best to lean on who I have that are positive influences in my life, and make sure I don’t repeat the same cycle on my own kids by telling them daily I love them and am proud of them. I hope that you can find comfort by doing the same! Sadly, my mother has engaged in and continues to engage in just about every type of emotional abuse you describe. Silent Treatment was and is one of her favorites. I remember as a small child how she would just start ignoring me, sometimes for days on end, and I never knew why. It was awful I would dance around her feet, literally, saying, Mom, Mummy, again and again, trying in vain to get her attention. Then, days later when she finally decided to acknowledge my presence, I would be meek and timid and uncertain, sometimes even a little detached myself. And then she would punish me again for not welcoming her back with happy open arms. Trippy and painful. As much as I read and know about NMs, including the fact that I was raised by one, the depth of their cruelty still amazes me. My mother gave me The Silent Treatment throughout my childhood. I seem to have blocked out the majority of the specifics connected to those memories, but I do remember some of things that triggered her Silent Treatment…among what I remember: if she thought I felt happier/more comfortable with my grandparents, if I didn’t clean the house, or if she didn’t like my facial expressions. When I was young, I learned to never have a differing opinion and to never question her decisions, actions, or motives. Fast forward to my mid-twenties (about 15 years ago)…she seemed to chill out a little bit, and her episodes of The Silent Treatment decreased to a handful of times per year. With a lot of therapy and time, I learned to speak my opinions, etc. She and her husband are spending the holiday with me. Yesterday, she had me drive them to a town that is 3 hours from mine because they wanted to “check it out.” Once there, I asked for an address for the GPS…in other words, what had they planned to see/do in the town? I told her that I was sure that she’d thought of more than just getting off the highway’s exit and then getting back onto it, so I was happy to go along with their plans. Although I thought it was a long drive, I was happy to do it…I thought it was fun to have a road trip and explore. She then said that, because of my attitude, she didn’t want to go anywhere but back to my home (3 hours away). And now, she hasn’t spoken to me since. What is your advice for adults in this situation? Should the adult child try to force communication? Pander to the The Silent Treatment parent and let them continue their behavior? Also, I wish that I felt less affected by The Silent Treatment (now, as an adult). But I guess the cycle is so encoded in my brain, I still feel paralyzed by it at times. My mom is like that. She goes through periods of time that she wants nothing to do with me…..then she wants to be around me all the time and I love the attention. I miss her so much when she withdraws. She has done this to me for years. It hurts a lot. I am not sure how I should act. Recently, I wasn’t able to come over for Christmas day. My husband, myself, and one of our children had the stomach virus. It was pretty gross. We didn’t want to give it to her and my dad. She now won’t speak to me because we didn’t come over. However, just a few days prior she didn’t come to my house because she had a bad cold. No one was angry with her. She pins my dad against me too….hurts a ton. So he becomes her voice box and tells me that I put my husbands family first….so completely untrue. Even though we changed plans on his family and had Thanksgiving with just my family. I remember as a little girl she would ignore me for days sometimes. When I moved out, she ignored me for over 6 months. How should I act now? I call, text….nothing…. My father did not speak to me once from the time I was 13 years old until I was 16. If we were in the same room together he wouldn’t look at me, speak to me or acknowledge my presence. Every night at dinner he spoke to my brother and my mother and if either of them asked me a question or talked to me at all he would glare at them and change the subject. My mother worked a couple of weeks nights a week and I hated those days. I knew I would come home from school and no one would speak to me until the next day when I went to school. He ignored me at holidays and my birthday and on family vacations. When he finally broke his silence he let me know that I would have to change in order for us to heal our relationship. Obviously, I still had a “bad personality” so the belittling, name calling and ignoring continued on and off through my entire life. In my own mind I never realized that this was abuse until I was in my late 20s. I mentioned this to a friend one night on the phone and he was absolutely shocked and horrified. I was surprised by his reaction. I had never even told anyone about it before because I was so ashamed and thought it was my fault. After speaking to my friend, it’s then that I realized how abusive it really was. I would never, ever minimize physical or sexual abuse. But there were times that I wish he would just punch me in the face so I would have proof that he hated me. Sometimes when it was really horrible I would go to my room and take something hard like my curling iron or a hairbrush and repeatedly hit my head in the same spot. I never admitted this to anyone, even a therapist. I realize now I needed a physical outlet for the internal destruction I was going through. I am just now starting to except the fact that I was abused as a child. Everything I’ve tried to research on the Internet involves parents that don’t live with their children and alienate them. This is the only site I found that it knowledges that this happens within your own home. I’m so sorry that you had to experience such extreme emotional abuse from your father. 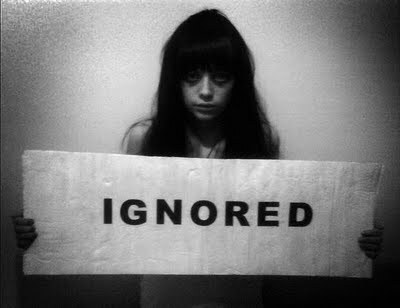 The silent treatment is a device that many Narcissists use. Also, picking one child to be the scapegoat and one child to be the golden child is typical in families with a Narcissist Parent. (It sounds like you were the scapegoat child.) When you get a chance, google Narcissism for more information about narcissists. I’m glad you found this site. I’ve found this site to be a great help to understanding emotional abuse. Thank you and thank you again for acknowledging me and for this site. I am very familiar with narcissistic personality disorder and being a scapegoat. Being a “golden child”, as my brother was (is), comes with its own fair share of heartbreaking abuse. I want to just say one more thing for anyone that reads this or it might come across this site. The relationship with my father was the only long-term abusive relationship I’ve ever had. Many times you hear that you are doomed to repeat this type of relationship in your life, but you don’t have to. His abuse taught me what I would and would not accept from other people in my life. I knew very early on, in any kind of relationship, who I needed to distance myself from and who would treat me with love and respect. Through emotional abuse, you have knowledge that many people have to learn through trial and error. I think of this as a gift. You can be your own little superhero with x-ray vision. You can spot those people that will mistreat you before they have the opportunity and decide to happily move toward healthier people and relationships. You just have to remember that you actually belong with those strange creatures that treat you with dignity. I have the most beautiful husband and friendships in my life. I sometimes still feel like I have to hide or that I don’t fit in, but the greatest thing about healthy people is that they love you for you, Invisible Scar and all. this was my mother to a T, and i think i have done this more than i like to think about, but certainly never to the extent or degree that happened to me. i really like this series of posts you are doing. I am in my early 20s and moved home after college. Unaware of my abuse, I started going to therapy for my anxiety, depression, anger, and eating disorders. After 6 months of therapy I finally looked into my past and researched childhood emotional abuse because I was curious. I never thought what I went through was abuse, I thought it was just “normal parenting”. So thank you for this site. I was never a bad child. Never slept around, got straight A’s, never lied to my parents, never did anything shady. Sure I didn’t clean up my stuff all the time or I talked back to my mom sometimes. These are normal teenage things that yes, are not okay but should never be punished by withholding dignity, love, or respect. My father often gave me the silent treatment for days or for weeks, hit me in the head, spat in my face, and called me names underneath his breath. After the silence I was expected to welcome him with open arms or else I would get another dose of verbal attack to make me feel as if it was my fault. I was often confused, detached, and angry but did not know why or what to do with it. At first I used anger to cope with my hurt, but I soon learned that would only get me more slaps so I became silent. My mother was and is still so depressed she neglected me emotionally and psychologically. Knowing how God loves is the complete opposite of how my dad loved me. Christ saves me. I know I am deserving of love, unconditionally. Not conditionally. I am making steps to heal. I am currently in a very loving and committed relationship. He continually loves me and shows me grace and points me toward Christ, but I often find myself pushing him away. I react with anger when he tries to love me sometimes. I feel as though I treat him as I treat my father. I don’t want my father’s love. Why do I need it now? I don’t need his love. In turn, I tell my boyfriend I don’t need him to love me and get angry. In my head I tell myself I don’t need anyone to help me or love me, I’d rather be isolated. I also have an inner dialogue that hates myself and beats me down. It is starting to hurt him, rightfully so. I’m still in therapy, but I am having a hard time receiving love and controlling my anger. Anyone else feel this or any good advice? I would like to say THANK YOU for this site — I have always known I lived with “invisible scars” but I wasn’t sure how to actually NAME it. My mother, who passed away last year, was the very definition of NPD and I am just now coming to grips with my repressed memories of my childhood years. While she was never physically abusive toward me, I witness a number of incidents with other family members where she would physically beat them down… All those incidents as I got older were retold in very “ha ha” tones… as if it were no big deal that my mother beat the crap out of my cousin with a golf club. Adding to my “guilt” of talking about this… my father was a Preacher .. my mother the Preacher’s Wife, which just fed her NPD in a major way. I was always taught that you “do not air dirty family laundry in public”… so, I learned to keep it all to myself. At 40 I am only now starting to unravel the hell that was my childhood… It took her death to free me. When I was about 11, my mother decided to ignore my existence for a whole week. She would not look at me, respond to me, or in any way acknowledge me. I asked her then, and many more times over the years, why she did it and she always told me I knew very well why. I have never known why and it was one of the most painful experiences of my childhood. It makes it very difficult for me to set boundaries in relationships now because I’m scared of losing everything if I do. As an adult, her latest silent treatment has lasted 23 years. I no longer care. I’ve been trying to find information online that relates to my experience, and I’m finding it hard, which highlights to me how abnormal it must be. My problem is with a “stepfather” (I use inverted commas because he is not a father in any sense of the word, merely my mother’s partner). He has been living with my mother for around 15 years now and ignores us, her three children. I’m an adult so it doesn’t bother me too much, I just ignore him back. But my youngest brother, who is autistic, was raised in a house with this man from the age of 5 (he’s now 20). With this guy, silent treatment is an understatement. I’m not talking about for a couple of days or weeks, or even years. I’m talking 15 years of not speaking to a child who lives under the same roof. No “good mornings” no “happy birthdays” no “I’m boiling the kettle do you want a tea or coffee” Nothing. For 15 years!! He certainly never takes him out or spends time with him. H wont even be in the same room. I can’t find anything about people who ignore others (especially children) to this extent, and what it means. I feel that this type of treatment would be detrimental to anyone, but as my brother has Austism it is particularly hard on him and he has difficulty understanding it. He has done nothing wrong, this freak has treated him this way from the start, since he was a 5 year old. Apparently he also has a daughter with whom my mother has no contact because she’s “not her daughter”, just as we are “not his children”. They seem to want to avoid responsibility for each other’s kids despite his living in the same home as my mother and brothers. Wow, I relate to so much..silent treatment being a part of it. Now potentially or more so in the past without any awareness I’d feel so out of control and confused, anxious and angry..layers of emotional unconsciousness and acting out from such a place has defined so many sad losses in my life.My elder sisters ,younger sister and mother aren’t avaliable to discuss the emotional harm ..and the family systems still has defining roles althought the metaphorical chess pieces have moved between indidividuals.I equally painfully notice how much I have acted similarly , and still notice my desired purpeputated need to gain approval.I frequently come to feel the victim..angrily working through conversations that still populate my mind. Yet the contradiction and the changes when it’s OK for others to voice opinion are seemly done without acknwledgement or baring on previous acts or statements. I don’t know if my mom gave the silent treatment when I was young, but I remember it throughout my teens – I suspect she did it when I was younger because she still does it to this day, even though she has mellowed a bit. I just found this article because I am looking for insight since I am about to stay with my parents for several months. I am 58 now, and still affected by the emotional abuse heaped on me by my mom. I wonder if this next stretch of time will be the end of my sanity. My cousin and my brother tell me I’ve learned to cope, and that I am so much stronger, but, one of my coping mechanisms is to stay as far away as possible (we are usually thousands of miles apart) and to make all visits short. Yesterday being mother’s day, I see all my friends posting stuff on facebook about how much they love their mother’s and how wonderful they are/were. I just can’t do that. I’d love to post about how abusive my mom was/is, how she can make life absolutely miserable, and how she could never even begin to see or understand the damage she;s done because she lives in her on Lala-Land where everything is fine and we all get along so well. But I don’t, because I fear that people just wouldn’t understand. Especially those friends who’ve known her almost as long as I have. She’s great if you are not her daughter. Anyway, I found you’re article interesting even if it doesn’t address coping mechanisms – I'[ll keep looking. Thank you so much for making me laugh!! I think I had so much identification with your comment the most. For me, my only solution is to continue to pray for my mother, and maybe finally for myself get the help or closure I may be needing with a professional. I went through the silent treatment most my life with my family. They acted like I didn’t exist unless I did something wrong. I would sit at the dinner table watching them talk to each other as if I was never in the room. It was so awful that I used to excuse myself and cry in the bathroom and put powder on my face so no one could tell I was crying and go back to the table. When I was a teenager my parents divorced and I began to live alone with my dad. He was often angry that I didn’t take the initiative to do chores. Often he would leave me alone for several days and when I did see him he wouldn’t say “hi” or acknowledge me in any way. He’d just walk right past me. Later in life it was difficult because when I was married my spouse was treated like she didn’t exist. On my birthdays, other than blowing out the candles, I was ignored. My mother even believes that birthdays are more a celebration for her than me because she gave birth to me. I think this type of abuse has been hard to process because nobody remembers it accept for me. You can’t remember what you have ignored. Luckily, I have a good psychiatrist who has validated these experiences and helped me gain insights on them.